So, this may be my last chance to post before Christmas. Have a great time everybody, and if I may take a moment to say a big thank you, via the blog to everybody that has helped me through the year. So whether you have helped me change my chain, guide and clutch (BIG thank you Mr Jordan), or helped me out on a blog post (Mr Orton at the Rimini Lambretta Centre gets a shout out on this one), or you have commented, shared, tweeted, favourited or simply just read a post on the blog – thank you. I hope you and yours have a very Merry Christmas, and a happy, healthy and prosperous New Year. 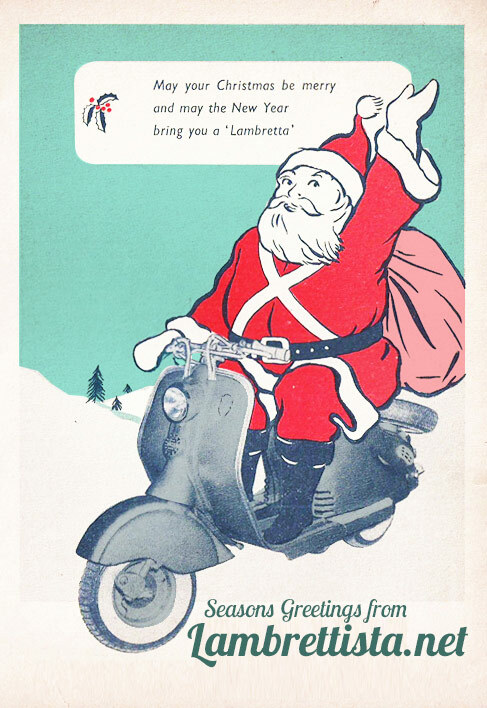 This entry was posted in Admin, Lambretta Imagery and tagged Admin, Christmas, Holiday, Merry Christmas, New Year, Thank you by crocodilejock. Bookmark the permalink.